GLOGIRLY: Bird Catcher Pro MEGA Giveaway! I like you on FB and Twitter. Awesome giveaway! My cats love their Da Bird feather toy but it is kinda expensive to keep buying the replacement feathers. I know they would be thrilled to win this toy!! Well, of course I like you on Facebook. The wand is VERY lightweight and much more stable feeling in the hand than some other feather wand toys we've played with. We also love how long it is. Waffles can catch some major air! Sincerest condolences on the loss of your fave Bird Catcher Pro feather...I'm sure Waffles had nothing to do with it! So happy to hear you have a new magic wand and feathers galore to play with. We love DaBird! ...but gotta be honest, this new Bird Catcher Pro is much better!!! The wand is much nicer and easier to handle. The feathers have been holding up better. We love feathers in this house. Mom built us a catio so we can't drag in fresh feathers so more faether toys are always welcome here! 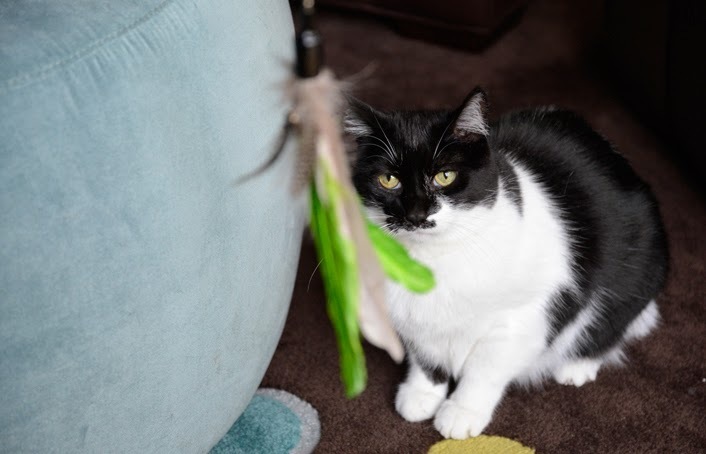 My kitty kitty "Uno" (born 1/1/11) would LOVE to win a new feather toy! Thanks for the chance to win. I like Pets Can Play on Facebook! I follow GLOGIRLY on Twitter and tweeted about the giveaway! 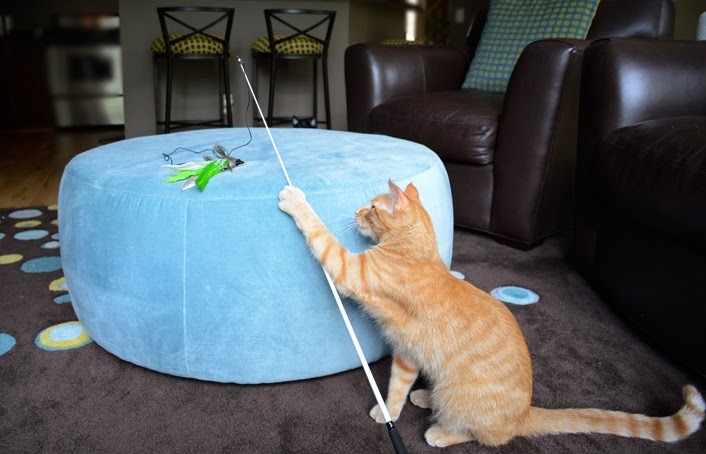 I follow Pets Can Play, Inc. on Twitter! You know we Like you, and now do the Pets can Play, but just count me as 1 because I can't wait, am bouncing over to Amazon so Brat can have an extra groovy Get Well gift! While all of the Farm cats would like it I think Sherpa would like it most. Wait!!!!! Am I completely exhausted & hallucinating or did Katie say Oramge Crush did somethin right in there?????? Brulee is a little diva and hardly plays with any toy, but she drops all "airs" and will play with feathers at the drop of a hat. Please enter us! We liked & now follow Pets Can Play! They look cool! My siblings Bane and Letty are feather fanatics! I liked GLOGIRLY on FB! I tweeted to my friends about the giveaway! I am following Pets Can Play on Twitter! What a great giveaway. We love da bird, but it's rationed out because we kind of destroy it really fast. This sounds like lots of fun! We already like you on Facebook. We would like to enter the giveaway. It looks like a pawsome toy! We liked Pets Can Play on Facebook. We shared your giveaway on Facebook. We are all feather addicts. Give us a feather and we'll destroy it. Please enter us. We just went liked them. We already follow you and we sent out a tweet about the giveaway. Will do as soon as we leave here. What a pawesome giveaway! We both love playing with feathers! We're crossing our paws we win! We like Pets Can Play on Facebook! We forgot to say we tweeted about the giveaway but we did. 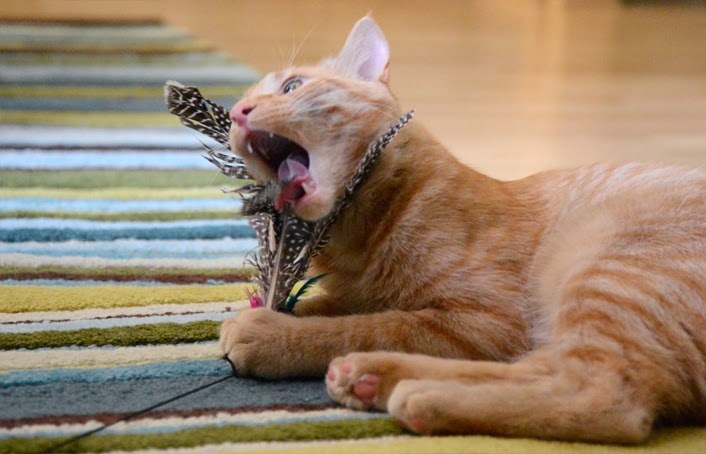 We just shared a photo of me playing with feathers on Glogirly's FB page! we all love feathers too, and would love one of these! we like you on Facebook also, so that makes two entries. I like Glogirly AND Waffles on Twitter. Thanks for answering my question. Tell you which kitty? You're joking, right? There are five of us and we all love feathers. Considering what Robin just went through with Da Bird, I'm loving the handle on this thing..
Ohhhhhh, I LOVES feathers! That's a really cool toy and I'd love one of those. We both love feathers! But Minchie really goes crazy for them! We already like/love Glogirly on Facebook. We just liked Pets Can Play on Facebook. Of course we like you on Facebook. We like you everywhere. Did you see the picture of Tommie that I put on your Facebook page? I'm still willing to come stare at The Orange One for you! That was mighty nice of the Bird Catcher Pro Wand Toy peeps to send a new one to you, Katie -- and to let you do a give-away! We aren't cats, but we would LOVE to win one for a kit-cat friend of ours! Our mom (KZK) already follows you on FB. We'll post a pic of us and our fave toy through her account! Thanks, Katie! And seriously - let me know about the staring thing, OK? I already like Glogirly on Facebook! I liked Pets Can Play on Facebook! I followed Pets Can Play on Twitter! Miss Viola is our crazy cat-toy loving cat! Oh my goodness!! That looks like the greatest toy wand ever! We would like to win one!! Our address is jcfloresinc (at) g mail (dot) com!! My kitties love these kind of toys. We would love to enter. Liked Pets Can Play on Facebook(Sue Brandes). Following GLOGIRLY on Twitter(katsrus2003) and tweeted the giveaway. Following Pets Can Play on Twitter(katsrus2003). FaRADaY: WAAAAAITAMINNIT. WAND Toys? You's giving away WAND Toys? Am I in? Do submarines have screen doors? Do penguins have knees? Do pilots take crash courses? Maxwell: uh, dood. All those phrases mean "no". Allie: well, I can see it's MUCH safer if *I* comment. We're following Pets Can Play on twitter! Allie: And of *course* we're following Glogirly on twitter. Allie: And we shared the giveaway on facebook! WEll we have about 10 cats here that love DaBird so we always need some new ones. It is a super toy. I liked everyone on Twitter and we had already liked you on Facebook. We tweeted about the give away! Squeedunkcats are now following PetsCanPlay on Twitter! 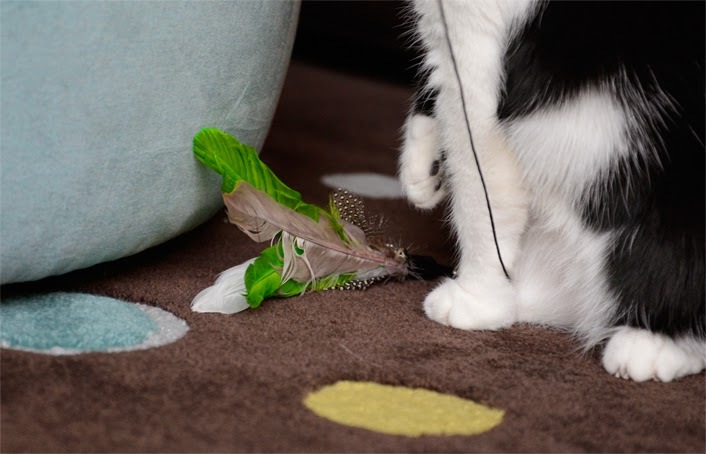 I love feather toys. I have a Da Bird toy, but this one looks way cooler. We already 'like'' your FB page too. Damn my friend you should have used Rafflecopter for this one! Taking forever to get to the bottom of the page! Cody would LOVE TO WIN THIS!!! Gracie and Zoe are crazy for anything that moves! We bet they would love this! Holy Cod Ultra Guinea Fowl feathers!! Count us in!! We already liked you on Facebook - we've always liked you! Now we like Pets can Play on Facebook too! kintaro is the biggest feather fanatic in our house. he goes crazy when a feather toy is brought out for him to play with. we "liked" pets can play on facebook. we just posted a photo of speedy (playing with one of his toys) on your FB page. i like you n facebook! Just liked Pets Can Play on Facebook! Adora Mae with the 12 inch tail and Michael Jordan jumping skills would love a new wand toy to play with . And she also has a feather fetish. amy12265@att.net . I like you on twitter and I tweeted. We'd like to enter and donate the prize if we win please :) We like you on Facebook, follow you on Twitter and ADORE you in real life! Hey there! That looks like a really fun toy. Just wanted to mention that if you're gonna attend my blogoversary (I know I sent you an invite), there's a poll on the event page for your favourite toy. Katie, you and Waffles will wanna vote, for sure. I already follow you on twitter. Tweeted! Peep and I have both already liked your page on Facebook. We're followin' Pets Can Play on Twitter. Bode shared my pin so I think it counts as another share. I gave in and followed them on Twitter. Oh this would be great for Sneakers. He is a rescue boy, 3-4 years old in a home with two seniors. The old farts want nothing to do with him and poor Sneakers is always looking for someone to play with! This would be a great option to add to his toy rotation! We love you on Facebook! We have a houseful of rescued kitties, but little Mary, at six months, would have to be our current feather fanatic. as I am the only cat in this house for now...I AM the fev-ver player extraordinaire! Both Wilbur and Louie are avid "players". They like just about anything on a wand, and usually manage to detach/destroy the object at the end of the wand, so having replacement feathers would really appeal to them (and to their mom)! Their favorite toy is "Stumpy", a catnip-and rattle filled possum toy. 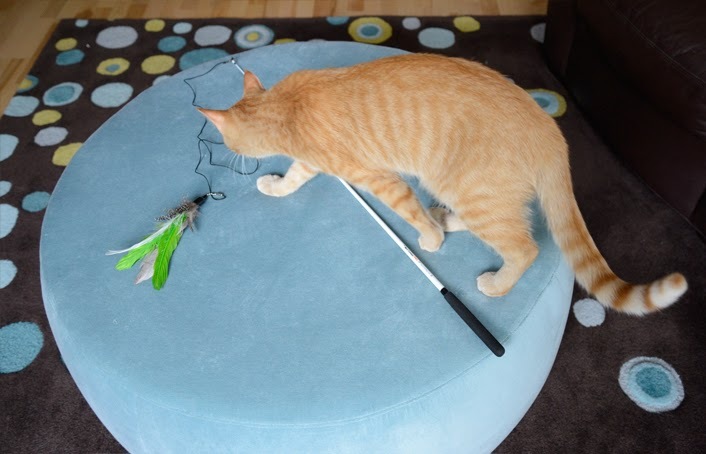 They have actually never had a feather wand toy (poor, deprived kittehs!). We already like you on Facebook! Cullen is a feather fanatic! Punky (our chunky kitty) gets into it if he feels like it LOL.